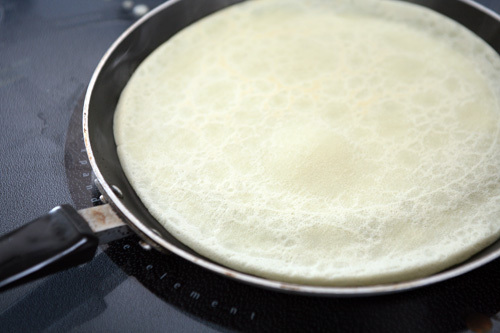 I woke up this morning still on a high from our decadent meal and feeling inspired to make crêpes for breakfast. I received this little crêpe pan, along with a crêpe-making lesson, from my stepfather for Christmas many years ago. Surprisingly, it hadn't been used in a few years and I decided that this was the morning to take it out of retirement. 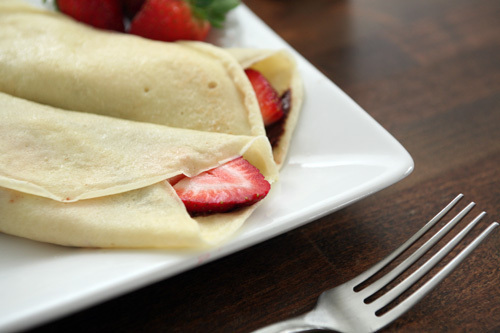 Crêpes are really quite easy to make and can be filled with either savory or sweet combinations. We chose sweet this morning. 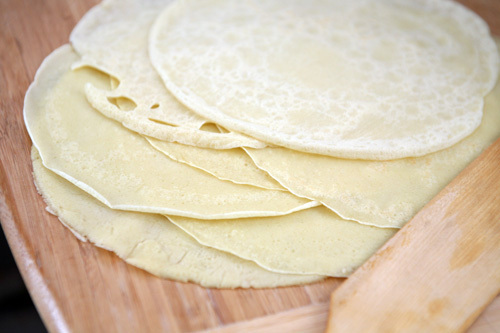 I'm inspired now to make one of my dinner crêpe recipes soon though... I used this Alton Brown recipe for the batter. 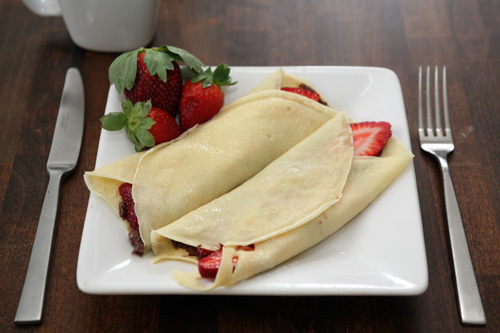 Breakfast: 2 french crêpes filled with PB & Co Dark Chocolate Dreams peanut butter and beautiful sliced strawberries. 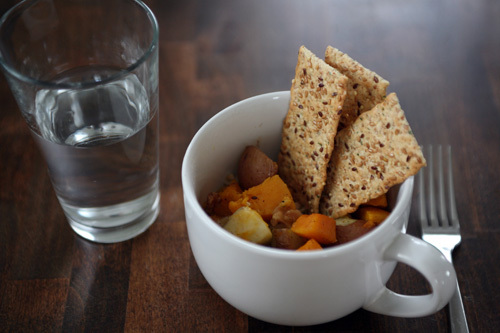 Lunch: the last of the leftover roasted squash + potatoes on bulgur, along with 3 Back to Nature Multigrain Flax flatbread crackers. The Back To Nature crackers are REALLY tasty...this was my first time trying them and I'll be buying them again. For dinner tonight we went over to our friend Amy's house where she had whipped up a fabulous pot roast. We brought some homemade veggie soup (similar to this post) that my hubb made along with some hearty oat biscuits that I made. At the end of the evening we traded leftovers so that we'll all have some variety instead of eating the same thing for days. It worked out quite well! 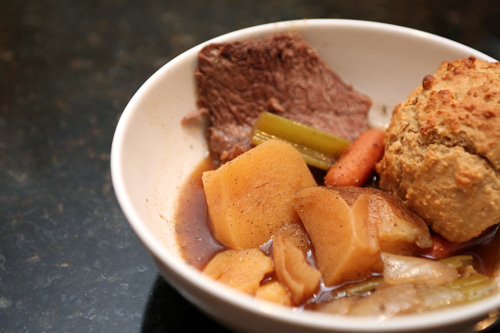 Dinner: 1 small bowl of pot roast, 1 small bowl of veggie soup, 2 hearty oat biscuits. 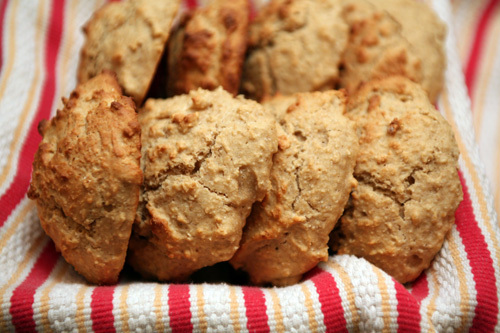 I used Erica's recipe for the hearty oat biscuits, but made a few modifications. Grind oats in food processor. Add the flour and baking powder and pulse for 10 seconds. In separate bowl, dissolve the honey in the vegetable oil. Add the milk and whisk to combine. Add dry ingredients to wet and stir with a fork until a soft dough forms. Drop biscuits on a greased cookie sheet. 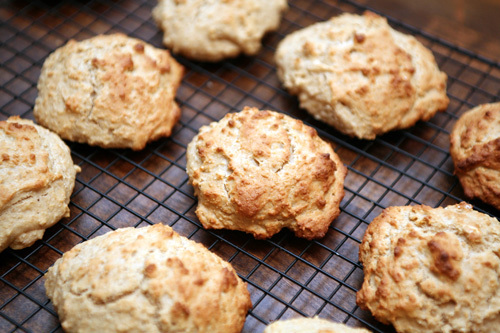 You should get 8-10 palm-sized biscuits. This recipe is really great and so fast to whip up. Like I mentioned above, next time I will add a bit of salt. I also think that adding rosemary or chives would be really tasty, and maybe a bit of sharp cheese. Alrighty, I'm exhausted and have to work tomorrow. :( So sad. I hope you all had a fabulous weekend!